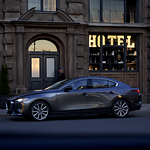 The all-new Mazda3 Sedan has been gaining popularity as the compact car to own this year. These are just a couple safety features making driving a unique experience on the highway. In order to make driving at high speeds safer, the new Mazda3 comes with the useful Blind Spot Information System. This unique system will monitor traffic behind your vehicle by way of sensors. If a vehicle is in a blind spot, your corresponding side mirror is going to begin to flash so you are alerted to which side to not travel. One feature in the Mazda3 that is helping to make your long commute safer is the Adaptive Cruise Control. Simply set the cruise control as you normally would, but then the forward mounted sensors scan down the road to locate a lead vehicle and create a driving buffer. That buffer is maintained by your vehicle braking and accelerating automatically.